Queen’s debut album was recorded between June and November 1972, but getting it released proved difficult. It wasn’t until a deal was made with Trident (the studio, record company and management all under one contract) that the self-titled album finally landed on store shelves July 13, 1973. Queen were eager to return to the studio to get to work on their second album. In the meantime, fans would be treated to one of those songs not from the first album in the summer of 1973, as “See What A Fool I’ve Been” was recorded during their second BBC session at Langham 1 Studio on July 24, 1973. “See What A Fool I’ve Been” dated back to the pre-Queen band Smile. “I had borrowed the idea for the song from a performance I had seen on TV,” Brian May recounted the song’s history on his website in 2004, “What I remembered was just a chord sequence and a couple of lines - I worked it up into a song [...] and it was a way for me to pursue an idea of using huge dynamics in a bluesy song to make it cut across heavy.” There was one problem, however: he’d only heard the song once and couldn’t quite remember who the artist was. Among the suspects was the famous blues duo Sonny Terry & Brownie McGhee. It would later become the source of much speculation as to which of their songs was the inspiration for “See What A Fool I’ve Been.” The answer would surface thirty years later. “For the second album, we actually demanded and got some real studio time, so we could spend some time doing those things,” Brian May (On The Record, 1982), talking about the big ideas the band had. In August, Queen returned to Trident Studios, armed with songs they’d been saving for exactly this occasion. They left clues on their first album as to the direction this one would take. The most noticeable clue is the short instrumental version of “Seven Seas Of Rhye” which closes out the album. “Freddie had half-written the song and we thought it was a nice tail-out to the first album, with the idea of starting the second album with the [finished] song,” said Roger Taylor (BBC Radio One, 1977). It’s here where the first grey area comes into view during these sessions. Famed photographer Mick Rock, who would shoot the equally famous cover photo for Queen II, notes in his book Classic Queen that a Freddie Mercury-penned track titled “Surrender To The City” was worked on during the Queen II sessions. Fan will immediately recognize the phrase as appearing in the finished recording of “The March Of The Black Queen,” so it is not a stretch to guess that there is a direct relationship between these two numbers, the exact nature of which we may never uncover. Mick does, however, note two other songs from these sessions which very much do exist, appearing on later albums: “Brighton Rock” and “The Prophet’s Song,” both written by Brian May. In a US Radio interview in 1977, Brian does confirm that “Brighton Rock” dates back to the Queen II sessions and specifically says it was not used on Queen II “because it didn’t fit.” “The Prophet’s Song” would appear later on A Night At The Opera. The working titled during the Opera sessions is confirmed by producer Roy Thomas Baker holding the tracking sheets as “People Of The Earth,” as seen in the Classic Albums documentary The Making Of A Night At The Opera. Things do become clearer as we look at the rest of the songs worked on for Queen II. As noted before, Queen had the song “Ogre Battle” in their live set and with the apparent “good versus evil” theme in mind, it would be the most obvious choice for the album. Both the album and single would have to wait, however. The band’s first album had only just come out and then the 1973 Oil Crisis hit, which vastly reduced resources for the pressing of new vinyl records and single. The band embarked on a tour, supporting Mott The Hoople for most dates, and in December recorded another BBC session, including “Ogre Battle” in their performance. 1974 would start with a difficult trip to Australia for the Sunbury 74 Festival in late January, which saw Queen insulted by the MC as he announced them to stage. Reports from fans who were there vary, but generally insist the band played fine and the audience wasn’t a vicious as is sometimes reported and that at the end of the day they went down well enough. Regardless, the experience was understandably quite negative for the group and it was a while before Queen returned to Australia. Back home, an unexpected opportunity arose when David Bowie cancelled his February appearance on the BBC programme Top Of The Pops. Queen were offered his spot and jumped at the chance. The fledgling Queen Fan Club sent out its first newsletter, announcing the forthcoming “Seven Seas Of Rhye” single (with the non-album B-side “See What A Fool I’ve Been”) and the upcoming tours, headlining in March in the UK and supporting Mott The Hoople in the US in April. The timing for these successes was impeccable. As the single and album climbed the charts, Queen toured the UK, including a concert at the Rainbow Theatre in London on March 31st. They followed the UK tour with another BBC session, putting down two new tracks from Queen II, “Nevermore” and “White Queen (As It Began).” An edit of the album recording of “The March Of The Black Queen” was also included for the broadcast. Queen toured the US with Mott The Hoople in April, with whom they’d become good friends. In May, Queen’s involvement in the tour was cut short as Brian May had developed hepatitis, the result of a dirty needle used for his inoculation before the January Australia trip. As Brian recovered, the band turned its thoughts to the next album. Hoping this was it, he wrote to Jacky Smith at the Queen Fan Club with his evidence, who then passed it on to Archivist Greg Brooks. Brooks contacted the fan and it was decided to hunt a recording of the song down. Such a recording appeared in a CD collection of Sonny Terry & Brownie McGhee / Big Bill Broonzy songs called Blues Brothers. The fan ordered the CD and sent a copy to Greg to give to Brian May himself, the only person who could definitely solve this mystery. Brian listened to the track and announced to the world on his website that this had indeed been the song! “That’s How I Feel” by Sonny Terry & Brownie McGhee was the direct inspiration for “See What A Fool I’ve Been.” And at the risk of sounding immodest, that fan was me. Queen II has been re-issued along with the rest of Queen’s back catalogue numerous times over the years. 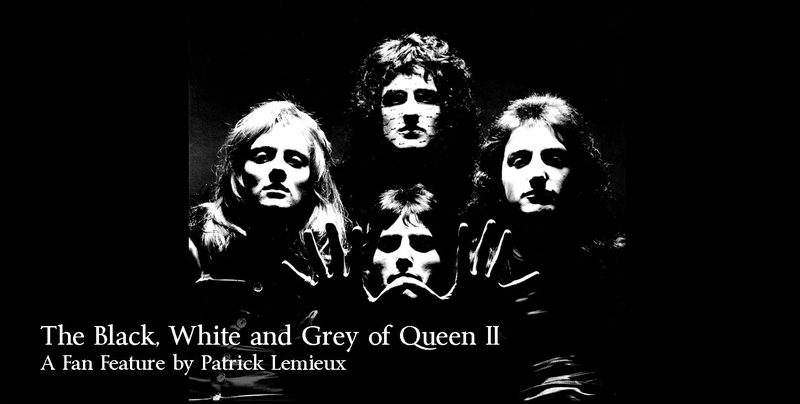 The 1991 remaster (by Eddie Schreyer) issued by Hollywood Records in North America featured the B-side version of “See What A Fool I’ve Been” as a bonus track, as well as two new bonus remixes, for “Ogre Battle” (remixed by Nicholas Sansano) and “Seven Seas Of Rhye” (remixed by Freddy Bastone). Most recently the 2011 remaster by Bob Ludwig featured a bonus disc which included both the B-side version and a remixed BBC version of “See What A Fool I’ve Been,” as well as the BBC version of “Nevermore.” From the vaults, the original full backing track of “Seven Seas Of Rhye” was included, offering fans not only the instrumental version of the song, but featuring complete finale performance unheard on the album. The BBC recording of “Ogre Battle” appears in an edited form on both the Queen At The Beeb (UK) and Queen At The BBC (North America). The lengthy guitar intro was removed for these releases because the master tape of that section was reportedly damaged. This “lost intro” does circulate around the internet, recorded by fans from the original 1973 broadcast. Earlier this year, Queen announced the forthcoming release of their famed 1974 Rainbow concerts, including the March 31st Queen II UK Tour show. You can find out more about more here. The March concert offers fans one of the earliest glimpses of Queen live, back before they had a vast collection of hits under their belt and stadiums like Wembley to fill. It is a show by a band riding its first crest of real fame (the first of many) achieved at last through years hard work and perseverance, all of which culminated on Queen II.